If Marco Polo had compiled a culinary resumé of his journey from Venice to the Far East and back, it would have looked like the menu of this new restaurant. The similarity of the explorer’s work, Million, to the selection of dishes here is no coincidence. 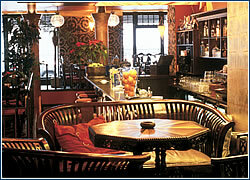 The Marco Polo restaurant opened in May of last year, taking its name from one of the eponymous traveler’s expeditions. It is inspired by food preparation methods in France, Italy, and Thailand, with the future emphasis intended to be on French cuisine. “Our main goal is to serve meals of high quality, prepared from fresh ingredients – meats, fish, and seafoods – of which few restaurants in Prague can boast. These great tasting, creatively adorned specialties need not be exorbitantly priced,” says head chef and restaurant manager Tomáš Turek. “We focus mainly on a local clientele, but tourists often visit us, too,” he adds. With a menu that consists mainly of seafood dishes, this establishment successfully combines the culinary philosophies of three ethnic cuisines. The Thai dishes are the most exotic, using many spices, yet they can be prepared very quickly. Although it might seem that you need a pocket encyclopedia to decipher dishes and ingredients such as mangold, jasmine rice, lemon grass, and Madras curry, it’s good to know that all the ingredients used are authentic. The local chefs were trained by a Thai chef, and all the finest fish and seafoods are selected from the Pacific Ocean and the Mediter-ranean Sea. The international selection means that for an appetizer you can order a Thai spring roll with vegetable filling and spicy fruit and peanut sauce, an Italian carpaccio, or a French foie gras de canard – a paté of white French duck livers marinated in Cognac and Port wine. If you have enough time for a substantial lunch, try the roast eggplant paté with tomato dip as an appetizer (which is prepared according to a Provencal recipe) or any of the Thai soups: Tom Kha Kai, a chicken soup with coconut milk, mushrooms, and fresh vegetables, or Tom Kha Koong, rich with tiger prawns, coconut milk, and vegetables. Popular main dishes include chicken breast marinated in coconut milk with vegetables, Madras curry and jasmine rice, and New Zealand lamb crowns in rosemary, with mashed potatoes, spinach, and pinoli nuts. Besides the permanent menu, you can also choose one of the Marco Polo daily specials, such as large tempura tiger prawns with mashed potatoes, or excellent Pacific Red Snapper with grilled vegetables and rice. For dessert you can enjoy Lutetia – a two-toned chocolate cake made with white and brown chocolate on a crunchy nougat. The wine list includes excellent Moravian, Italian, French, and Australian wines. For example, the French Chablis Premier Cru “Les Vaillons”, Chateau Clarke Baron Edmond de Rotschild 1998, or Jacob’s Creek Shiraz Cabernet from southern Australia. The most highly rated wine in the cellar is the 1998 Italian red Barolo. If you only have time for a quick bite, Marco Polo is still a tempting option, as it offers an interesting range of salads and Italian and Thai pastas. You can also stop in for just a glass of wine, coffee, or a cocktail. 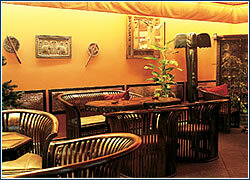 The restaurant is conceived in the Venetian style, while the café’s decor reflects the Thai influence. 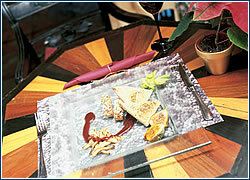 The motifs of the interior, which was designed by the restaurant’s owner, Milan Ouřada, are as diverse as the menu. The combination of colors, from fiery reds and oranges to brown earth tones, could be regarded as a compromise of Italian temperament and Far Eastern philosophy. Walls covered with thousands of river pebbles laid out in Venetian motifs, a fountain with a Venetian lion’s head, gondola poles, teak and ebony furniture, and antiques from Thailand and Sri Lanka – it’s all reminiscent of a famous journey from Venice to Peking. AN UPSCALE CAFE on Pařížská? Say it isn’t so. 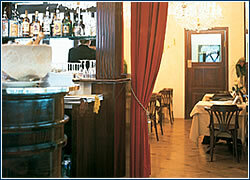 But those addicted to Italian-style decadence will find the allure of Cremeria Milano irresistible. This decidedly more gilded member of the Cream Dream family (compared to the branch on Husova) has elegance aplenty, in the form of sekt cocktails, imported Italian confections, dainty salads and baguette sandwiches, and all sorts of coffee concoctions. The real attraction, however, is the more than 20 flavors of genuine Italian gelato. Be forewarned: after too many months of Algida and other imposters, a mouthful of nocciola, cassata, or panna amarena may give your taste buds an overdose. A trip to the country and back into history await visitors to “Století” (Century), in Loděnice near Beroun. All of the spaces in the former 19th century Moravec estate were rebuilt in such a way as to preserve the architecture of agricultural buildings. 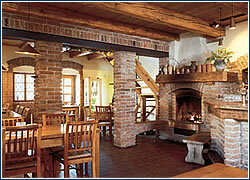 The residential building was converted into a cosy restaurant with a fireplace and seating for about 70, including a small dining room in the attic. The granary was converted into a salon with a barbeque grill, and in the summer the courtyard is used as an outdoor restaurant that seats about 50. The menu is inspired by both classic Czech cuisine and modern influences from abroad, including steaks and salads, pastas, roast fowl, and traditional snacks that go with beer. Pleasant service and reasonable prices make the dining experience complete. From Prague take the highway towards Plzeň, exit 10. As you leave the highway the restaurant will be right in front of you.